This week brought good news and bad news to WhatsApp, the cross-platform mobile messaging company Facebook acquired in a $19 billion deal in February. The good news: WhatsApp announced in a tweet Tuesday that it set a record by handling 64 billion messages in 24 hours. 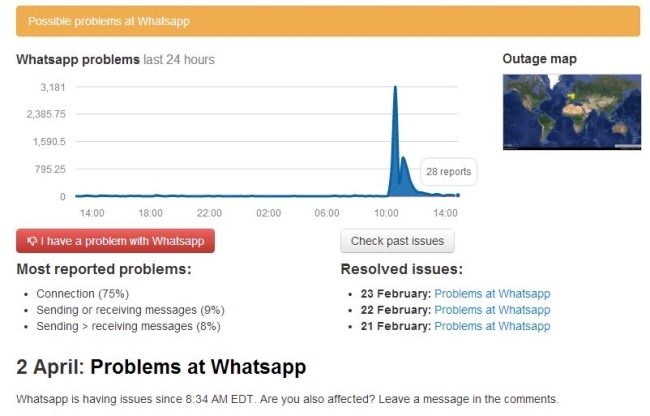 The bad news: The traffic may have taken its toll, as WhatsApp was down for a few hours Wednesday morning. CNET pointed out that the total of 64 billion messages is a bit inflated, as single messages sent to groups were counted as separate received messages, but the new record surpassed the previous high mark of 54 billion set on New Year’s Eve. As for the outage, TechCrunch reported it Wednesday morning, citing downdetector.com and a host of tweets. Readers: Do you use WhatsApp? If so, were you affected by Wednesday morning’s service disruption?